Autograph album presented by Mrs. John Wood of Northford, Connecticut, to her friend and schoolmate Mrs. Fannie E. Pierce at Christmas in 1883. 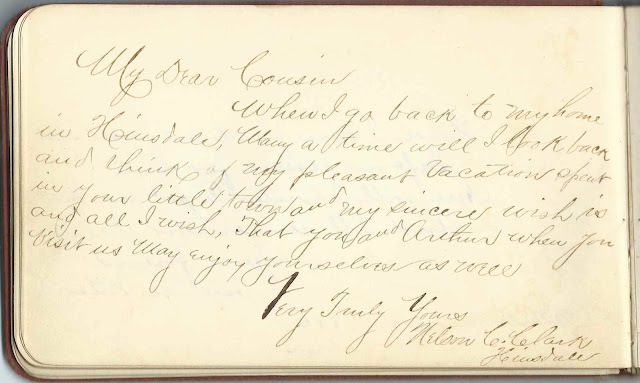 Fannie went on to collect inscriptions from friends in Maine, Massachusetts and Connecticut. She added notes with death dates to many of the pages. Fannie's notes on the page of Frances M. Wonson of East Gloucester, Massachusetts, who died on March 11, 1898, were especially poignant. From clues in the album and a record from Massachusetts Marriage Records 1840-1915, I believe Fannie was Fannie E. (Wilby) Lawrence Pierce, who was born about 1840 at New York City to Francis and Julia (Campbell) Wilby, both natives of Boston, according to Fannie's 1908 death record, although I saw at least one other record that gave Francis' birthplace as England. Leroy P. Lawrence, They had son Lyman Lincoln Lawrence, born at Boston, Massachusetts, on May 8, 1862. Lyman became a farmer at Cumberland, Maine. Incidentally, there are numerous inscriptions from Cumberland and Portland, Maine. Nathaniel Pierce, Jr., at Boston, Massachusetts, on June 15, 1869. Nathaniel, an engineer, was born at Portsmouth, New Hampshire, on March 5, 1842, the son of Nathaniel and Eleanor Pierce. Nathaniel inscribed what he thought would be the last page in the album, but one of his wife's Greely friends managed to fit in the last inscription. Fannie died on August 30, 1908; at that time Nathaniel and she were living at 13 Garrison Avenue, Somerville, Massachusetts. According to her death record, Fannie was buried in the Mt. Pleasant Cemetery at East Gloucester, Massachusetts. The album measures approximately 7-3/4" by 5" and contains the sentiments of 74 of Fannie's relatives and friends. An alphabetical surname list and an alphabetical list of the inscribers, together with any personal information they offered, appear at the end of this post. 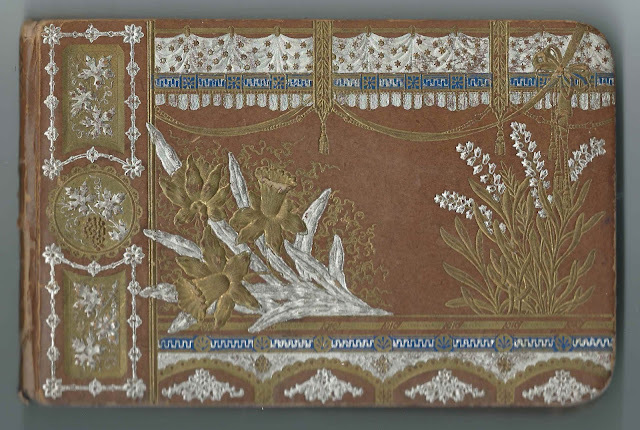 One page was inscribed by Cordelia Wilby on February 23, 1883. Could she have been Fannie's sister or cousin? If you have information on Fannie E. (Wilby) Lawrence Pierce or either of her husbands, Leroy P. Lawrence or Nathaniel Pierce, Jr., please leave a comment or contact me directly. S. G. W.; inscribed on September 19, 1885. Could the inscriber have been Samuel G. Wonson? Isaac A. Blanchard of West Somerville, Massachusetts; newspaperman; inscribed on January 5, 1902; his wife Lizzie M. Blanchard inscribed the right facing page. Lizzie M. Blanchard of West Somerville, Massachusetts; inscribed on January 5, 1902; her husband Isaac A. Blanchard inscribed the left facing page. Evelyn R. Coas; inscribed at East Gloucester, Massachusetts, on June 12, 1886. 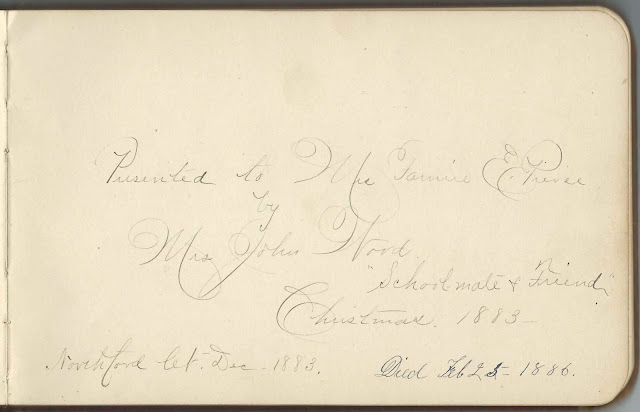 Fannie's later note: "Died 1897"
Fannie G. Coas; inscribed on September 17, 1885. Fannie's later note: "Died Oct 16 - 1895. Aged 25 y. 8 mo. 14 dy"
Edward L. Farwell of Cumberland Center, Maine; inscribed on June 9, 1886. His brother Ellis N. Farwell inscribed the left facing page. Ellis N. Farwell of Cumberland Centre, Maine; inscribed on June 10, 1886. 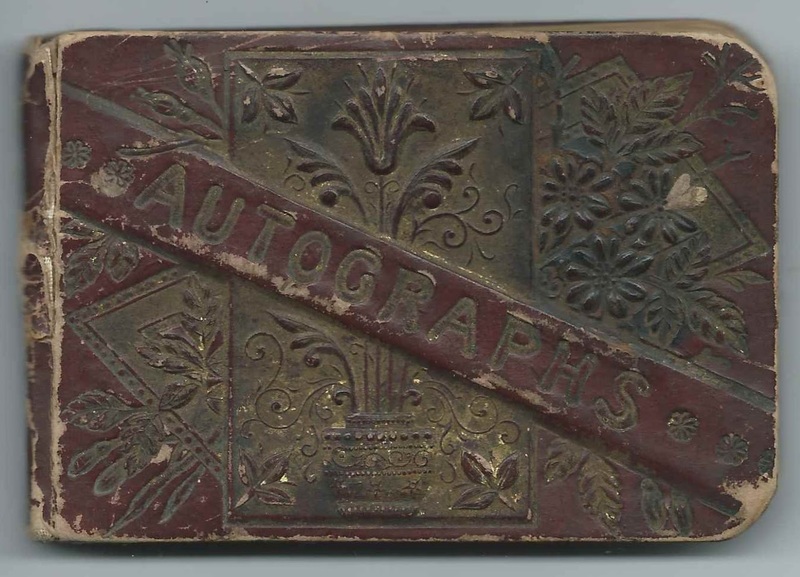 His brother Edward L. Farwell inscribed the right facing page. Sadie P. Farwell of Cumberland Centre, Maine; inscribed on June 10, 1886. 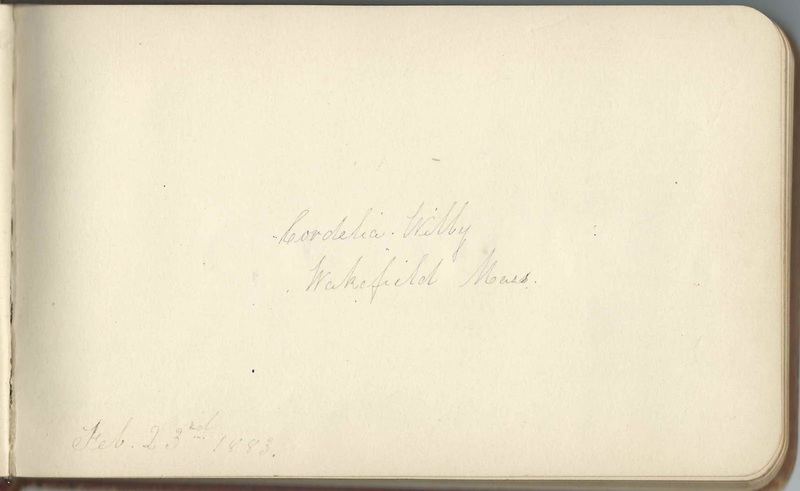 She was Sarah P. (Greely) Farwell, "Sadie", whose husband Simeon L. Farwell inscribed the left facing page. Simeon L. Farwell of Cumberland Centre, Maine; inscribed on June 10, 1886. His wife Sarah P. (Greely) Farwell inscribed the right facing page. Josie L. Mansfield of Wakefield, presumably Wakefield, Massachusetts; inscribed in September 1883. It may have been her mother Susan (Merrill) Mansfield who inscribed the left facing page. S. M. or L. M. or I. M. Mansfield; inscribed at Wakefield, presumably Massachusetts, on October 4, 1883. If S. M., the inscribed may have been Susan (Merrill) Mansfield, whose daughter Josie L. Mansfield inscribed the right facing page. Mary McAllister of Wakefield, Massachusetts; middle initial possibly G or J; inscribed on February 23, 1883. Fannie's later note: "Died March 11, 1892"
Nathaniel Pierce of East Gloucester, Massachusetts; inscribed on September 1, 1885. Presumably Fannie's husband. C. B. Rowe of Gloucester, Massachusetts; inscribed on July 3, 1886. 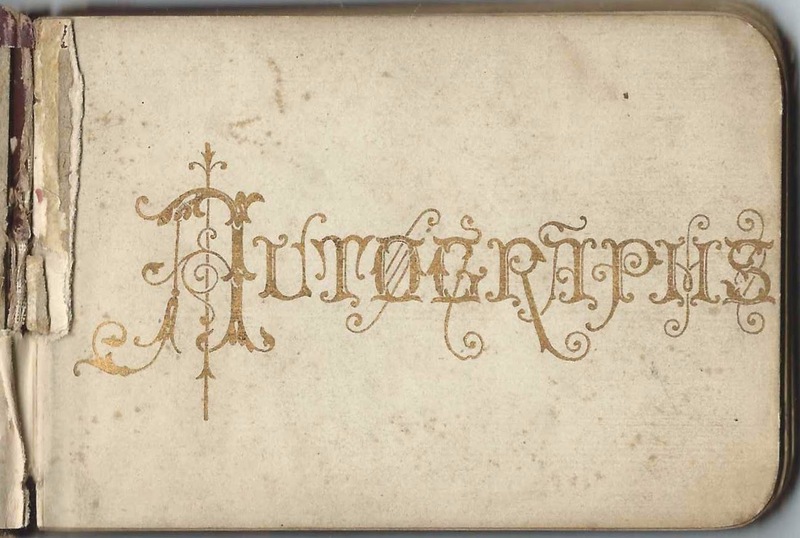 Initials so ornate, they may be something else. M. Sverljuga, Capitano Marittimo"; calling card pasted to page. Addie W. Thurston of Portland, Maine; inscribed on 6-5-86. Fannie's later note: "Dead"
J. A. Welch of Portland, Maine; inscribed on June 5, 1886. Joseph S. Welch, whose wife Myrtilla W. Welch inscribed the left facing page. Mamie Welch of Portland, Maine; inscribed on June 5, 1886. 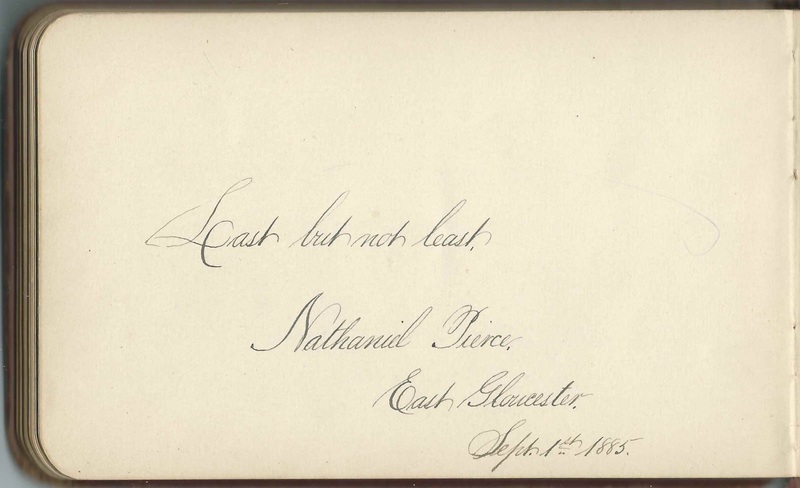 Nelson H. Welch inscribed the left facing page. Myrtilla W. Welch of Portland, Maine; inscribed on June 5, 1886; her husband Joseph A. Welch inscribed the right facing page. Nelson H. Welch of Portland, Maine; inscribed on June 5, 1886. Mamie Welch inscribed the right facing page. 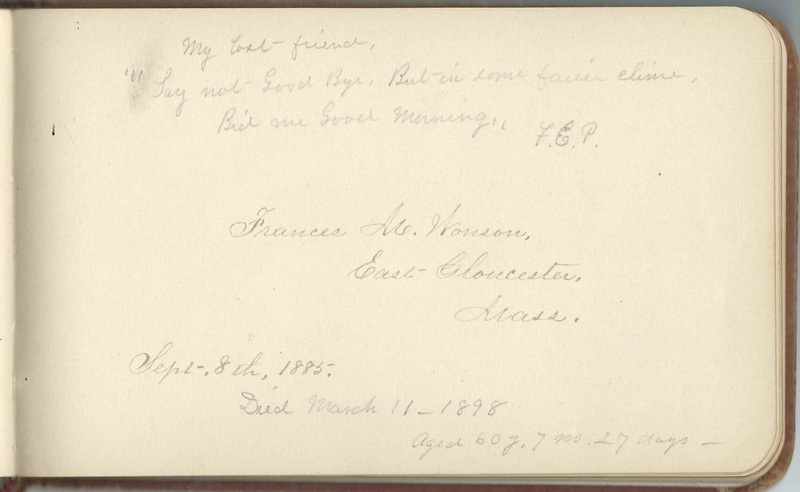 Frances M. Wonson of East Gloucester, Massachusetts; inscribed on September 8, 1885. 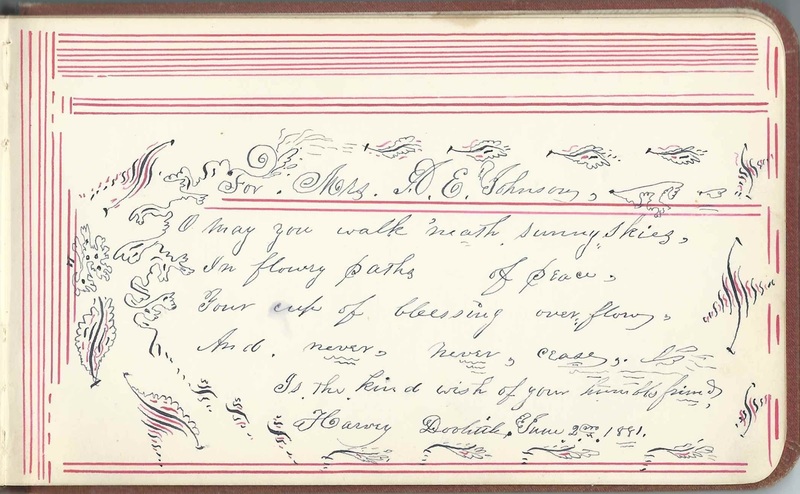 Album owner Fannie E. Pierce added several notes about the death of Frances M. Wonson: "My lost friend, "Say not Good Bye, But in some fairer clime, Bid one Good Morning" F.E.P. ; and "Died March 11 - 1898 Aged 60 y. 7 ms. 27 days"
Nettie Wonson of East Gloucester, Massachusetts; inscribed on September 21, 1885. Fannie's later note: "Died March 9 - 98. Aged 29"
Mr. and Mrs. John Wood of Northford, Connecticut, inscribed on August 25, 1885. It was Mrs. Wood, presumably, who gifted the album to Fannie at Christmas in 1883. N. R. Wright, paper scrap pasted to the page; inscribed to "Bro. Pierce", at Lynn, presumably Lynn, Massachusetts, on January 4, 1887. 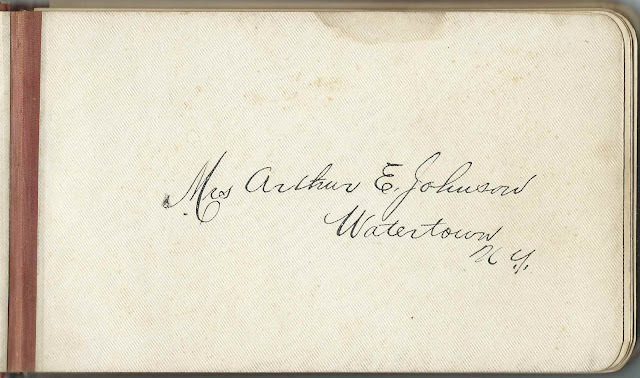 Later note, presumably Fannie's or that of her husband: "Died Mar 1st 1893"
1881-1890 autograph album that belonged to Mrs. Arthur E. Johnson, "Lizzie", of Watertown, New York. Lizzie and Arthur were married by 1881, judging from one inscription, and toward 1890 were planning to move to or visit Dayton, Ohio, judging from another. 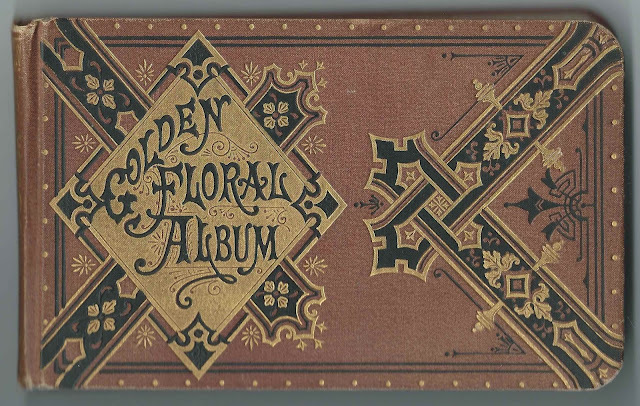 The album measures approximately 7" by 4" and contains the sentiments of over 60 of Lizzie's relatives and friends from New York, Ohio and Quebec. An alphabetical surname list and an alphabetical list of the inscribers, together with any personal information they offered, appear at the end of this post. The title page has an intriguing notation: "June 12 - 53". Was this Lizzie's birth date or that of her husband Arthur E. Johnson? Nelson C. Clark of Hinsdale, New York; Lizzie's cousin; mentions Arthur. 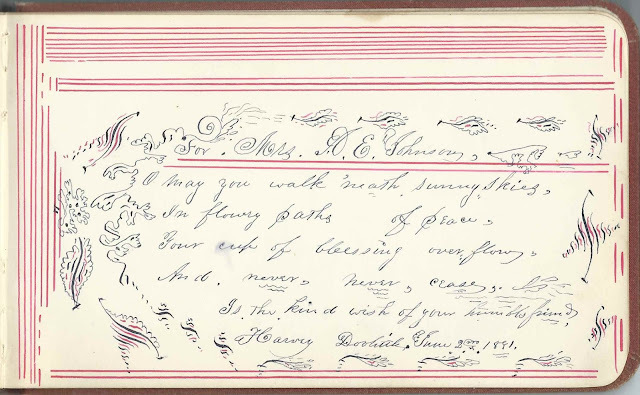 Was the the Nelson C. Clark of Chicago, who inscribed another page on February 20, 1881? Amanda Johnson, who called herself Lizzie's sister. Amanda was presumably Amanda J. (McDonald) Johnson, wife of George B. Johnson, brother of Arthur E. Johnson. Harvey Doolittle, inscribed to Mrs. A. E. Johnson on June 2, 1881; he called Lizzie Mrs. A. E. Johnson. N. E. Dillenbeck of Syracuse, New York; inscribed there on April 14, 1890; "When your [sic] on your way to Dayton, remember your husband is waiting, and when you get there, go straight for his hair, and give him an awful good beating." 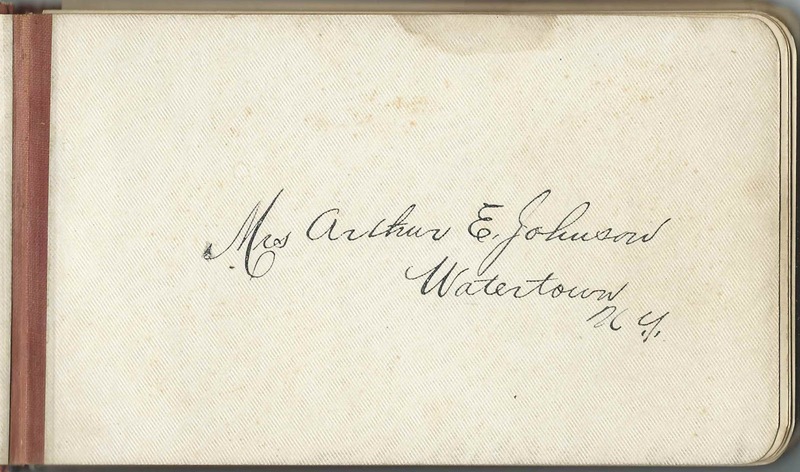 If you have more information on Arthur and Lizzie Johnson who lived at or near Watertown, New York, during the 1880s and who may have moved to Dayton, Ohio, in the late 1880s, please leave a comment or contact me directly. Truie Carpenter; inscribed at Watertown, New York, on March 27, 1887. Could the inscriber have been Gertrude Carpenter? Mrs. Alice V. Deuel; inscribed at Chittenango, New York, on July 31, 1881. A Find a Grave memorial indicates that Alice, born in 1852 died in 1882. She was the wife of William Estes Deuel. I. E. Gibbs; inscribed at Watertown, New York; Lellie Gibbs inscribed the right facing page. They may have been Israel E. Gibbs and wife Elsie Gibbs. Lellie Gibbs; inscribed at Watertown, New York. 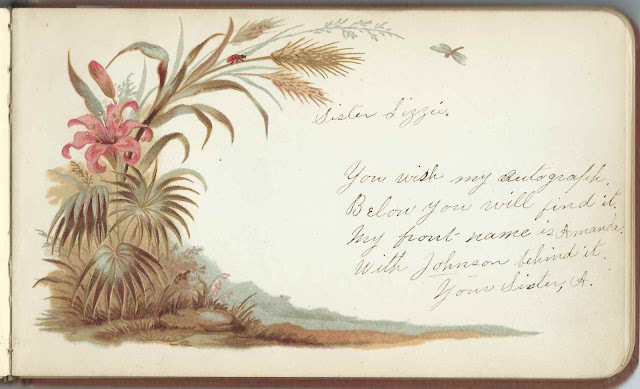 Possibly Elsie Gibbs, whose husband Israel E. Gibbs inscribed the left facing page. Van R. Gibbs of Syracuse, New York; inscribed on February 29, 1883. "Garnes St"
Stella Herrick; middle initial possibly M.
Mrs. Arthur E. Johnson, "Lizzie", album owner, of Watertown, New York. 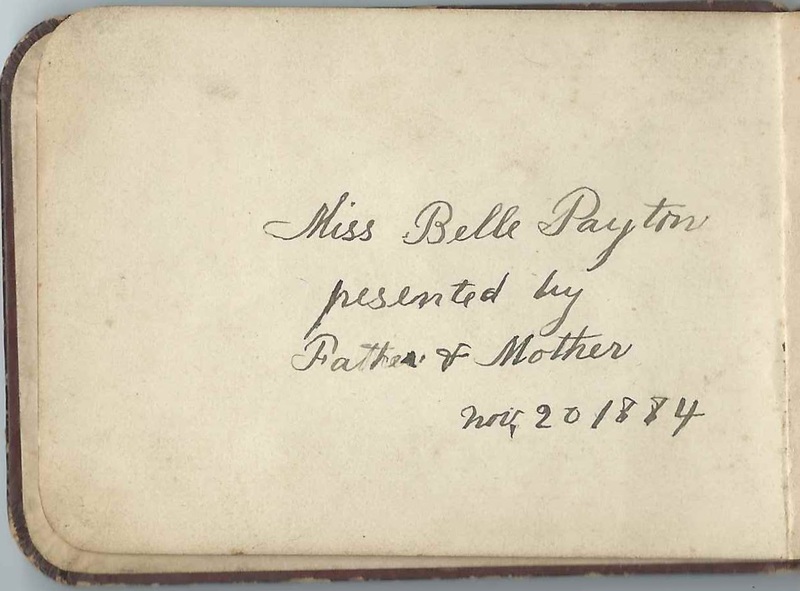 Autograph album presented to Belle Payton by her parents on November 20, 1884, which was a Thursday, possibly Thanksgiving Day. 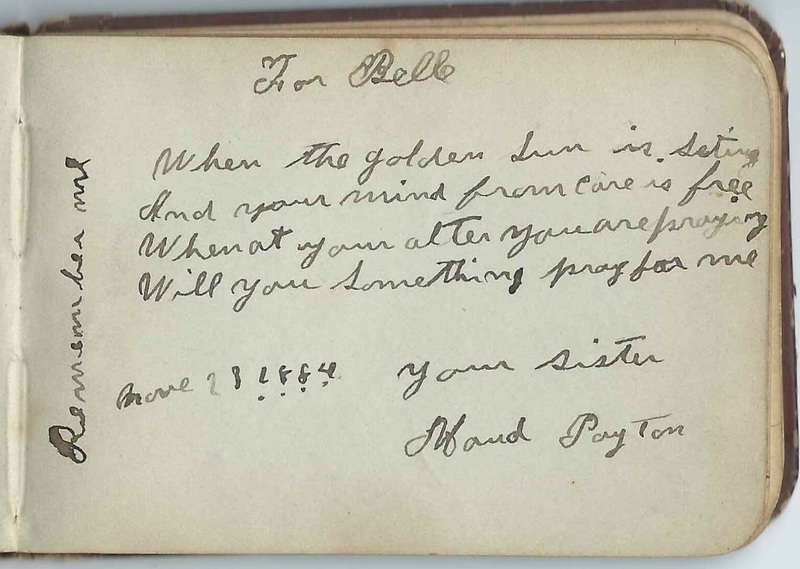 I believe Belle was Carrie Belle Payton, born December 1, 1872, daughter of Arthur Payton and Caroline C. (Corder) Payton. Two of Belle's sisters inscribed pages in her album, Maud and Maggie, and it happens that Carrie Belle Payton had sisters by that name. 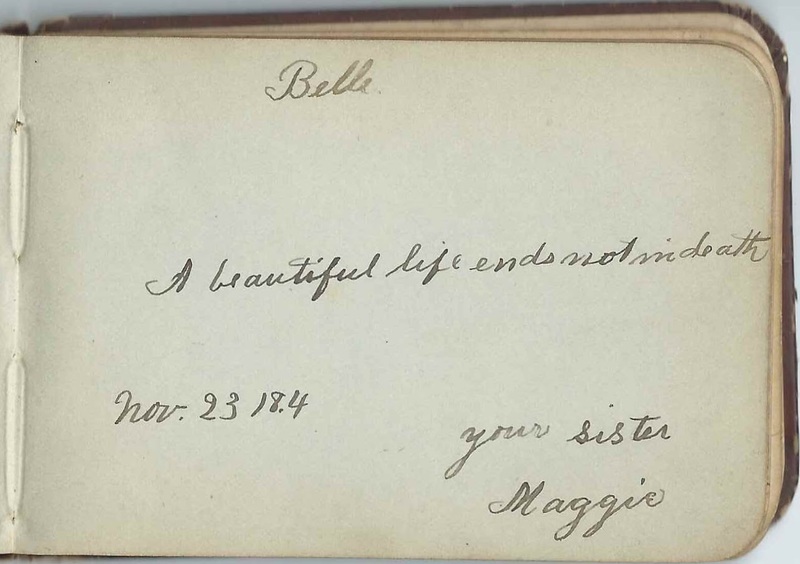 The album measures approximately 4-1/4" by 2-3/4" and contains the sentiments of 32 of Belle's relatives, friends, schoolmates and teachers. An alphabetical surname list and an alphabetical list of the inscribers, together with any personal information they offered, appear at the end of this post. Carrie Belle Payton was born December 1, 1872 in Illinois, the daughter of Arthur Payton and Caroline Cordelia C. (Corder) Payton, who were born in Kentucky and Indiana respectively. Carrie Belle married William M. Davis and had, I think, three children: Mildred, Willard and Della. Carrie, William and at least two of their children are buried in the Mount Olive Cemetery at Mayview, Illinois. If you have corrections and/or additions to the information above, or if you feel that Belle Payton was not Carrie Belle Payton, please leave a comment or contact me directly.